We are only free when we slip through the cracks. The great thing about being one of the early winners of an award is that it’s easy to be the first something. 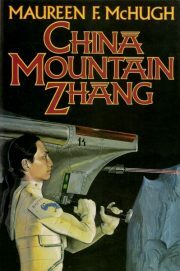 Maureen McHugh’s 1992 China Mountain Zhang may not have won the very first Tiptree Award, but it is the first book to win a Tiptree without sharing that victory with another novel. It also won a Lambda, was nominated for the Hugo and the Nebula and came in first in Locus’ Best First Novel. It’s also has a more challenging structure than the previous winners (A Woman of the Iron People and White Queen), which were relatively straightforward narratives. CMZ is an elaborate interweaving of several narratives, which touch each other only tangentially. With the Great Cleansing Wind relegated to an embarrassing memory of well-intended but disastrous political excess, 22nd Century Americans like Zhang can forget about politics and focus on their careers and personal lives. Zhang has advantages that many other Americans lack, the most obvious of which is that although Zhang is mixed race, he can pass for Chinese. This is very useful in a world dominated by sometimes xenophobic Chinese. But life is not perfect for would-be engineer Zhang, for reasons not immediately obvious to those around him.